Please take care, we have 2 different liner OD sizes; 5 mm x 81 mm and ¼ inch x 3½ inch. This liner contains a medium porosity glass frit made from sintered, deactivated glass. This liner can be used for hot and cold split and splitless injections. In addition, if used with a suitable packing material the liner can be used for large volume injection, thermal desorption, solid sampling and pyrolysis applications. If packed, a bed depth of up to 25 mm can be employed and retained in place with a plug of deactivated glass or quartz wool. This liner is the most commonly used style. I.D. = 3.4 mm. Same liner as 2414-1001 but treated with InertMask deactivation. Maximum temperature is 320°C. This liner is specially made for hot or cold split injections. The liners large internal diameter of 3.4 mm makes for good mixing of the sample with the carrier gas. The liner may be packed with a little glass wool if desired. The bottom of the liner has a small slot to ensure free passage of gas to the split exit. Alternative liner could be 2414-1017. Same liner as 2414-1005 but treated with InertMask deactivation. Maximum temperature is 320°C. This liner is made for SPME Arrow. The liner has an I.D. of 1.8 mm. Be sure that the OPTIC has a Top Boss Assembly for PAL SPME Arrow. This liner can also be used for hot and cold splitless injections. 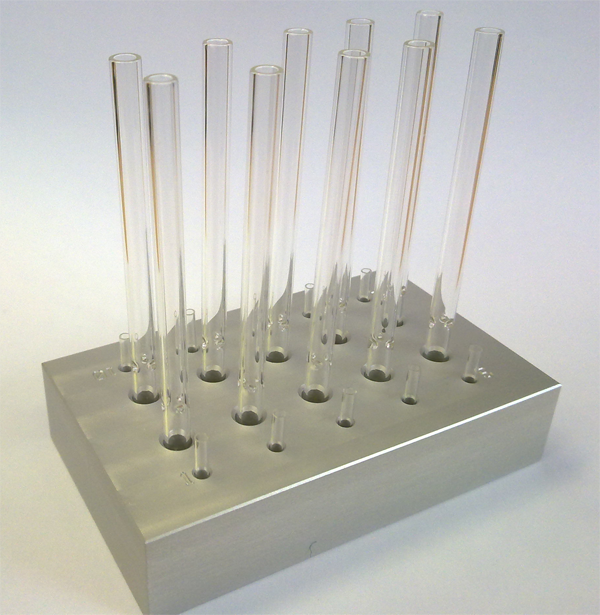 This liner is for hot and cold splitless injection of sample volumes below 3µl (best 1µl or less). The narrow internal diameter of 1 mm ensures fast transfer of the sample to the column under splitless conditions. With this liner the sample is not falling direct onto the bottom of the injector. This liner will give better results for the high boiling components. This liner contains a medium porosity glass frit made from sintered, deactivated glass. This liner can be used for hot and cold split and splitless injections. In addition, if used with a suitable packing material the liner can be used for large volume injection, thermal desorption, solid sampling and pyrolysis applications. If packed, a bed depth of up to 25 mm can be employed and retained in place with a plug of deactivated glass or quartz wool. The taper will improve the sensitivity for trace, active samples. PAHs, Mineral oils, Drugs of abuse. Same liner as 2414-1007 but treated with InertMask deactivation. This liner can be used for US EPA 8270. Maximum temperature is 320°C. This liner contains 3 small indentations made to hold the microvial in. It is used for Difficult Matrix Introduction (DMI) in combination with 2406-1010 or 2406-1020. This technique extends the capability of OPTIC to the analysis of dirty liquid samples containing non-volatiles and/or solid-like suspended matrix. 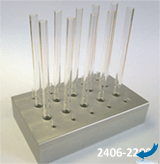 Row sample or roughly filtered extract placed into a sample container (micro-vial, p/n 2406-1010 or 2406-1020), which is inserted into the liner. Same liner as 2414-1013 but treated with InertMask deactivation. Maximum temperature is 320°C. This needle guide used in combination with 2414-1013 or 2414-1014. This quartz liner contains a medium porosity frit made from a sintered quartz. The liner is specifically developed for the high temperature applications (> 500 °C) with a prolonged analysis time (>10-15 min) when the use of the standard borosilicate liners can be problematic. Pack size: 5 pieces. Tenax GR is a porous polymer resin based on 2,6-diphenylene-oxide plus 30% Graphite. It is a widely used adsorbent resins for use with Purge and Trap Thermal Desorption for applications such as trapping VOC’s in air and liquids. Tenax GR is especially beneficial in trapping volatile organics from high moisture content samples due to its low breakthrough volume for water. Tenax GR can be used with: Hydrocarbons, Alcohols & Glycols, Aldehydes and Ketones, Halogens, Amines, Aromatics and Terpenes. Can also be used for liquid injections.